The Upper Petrovsky (Vysoko-Petrovsky) Monastery. The Upper Petrovsky monastery, located in the centre of Moscow, has several linkages to the struggle for the throne in the early Romanov period. With its bright, richly decorated bell tower at the top of Petrovka Street, the Upper Petrovsky (Vysoko-Petrovsky) Monastery occupies pride of place in the heart of Moscow. Like the city’s other distinguished monasteries, this too has witnessed many turbulent events, and even played a role in some of them. Differing versions exist about the founding of the monastery, but most accounts credit the Grand Prince Ivan I (Kalita) and Peter, head of the Orthodox Church of that period, the Metropolitan of Kiev and All Rus. Russian principalities then were under the control of the Mongol Golden Horde, which played various princes against each other. In the ruthless struggle for regional power, Peter began to align himself with Ivan in 1315. When Peter moved the office of the Metropolitanate from the city of Vladimir to Moscow, in 1325, he bestowed the great spiritual authority of the church on the small but ambitious Moscow principality. This, in turn, played a critical role in the further consolidation of Moscow’s political authority under Ivan Kalita. Around that time, possibly as early as 1315 but more likely in the early 1330s, a log church was built on a rise of land above the small Neglinnaya River, and dedicated to Saints Peter and Paul. The medieval Book of Royal Degrees attributes the construction of the monastery to a vision by Ivan Kalita. The monastery was dedicated in homage to Metropolitan Peter, who died in 1326 and was canonized in 1339. The grand Monastery of Saints Peter and Paul had its origins from this modest church. Another account suggests that the church and monastery were rebuilt by Grand Prince Dmitry Donskoy after a devastating Tatar attack on Moscow in 1382. The destructive fire of 1493 again levelled the monastery. At the beginning of the 16th century, the Peter-Paul Monastery came to the attention of Grand Prince Basil III, who ordered its central church to be rebuilt in brick. The architect chosen for this project was apparently the prominent Italian builder known as Aleviz Novyi, author of the grand Archangel Michael Cathedral in the Moscow Kremlin. It is thought that this was one of a group of churches built by Aleviz between 1514 and 1517. The structure was dedicated as the Cathedral of Metropolitan Peter in August 1517, and the monastery assumed the name of Vysoko-Petrovsky. The unusual plan of the small cathedral rested on an octagonal first level, whose bays at the points of the compass were larger than those on the diagonal. The upper tier is octagonal and may have had narrow windows in a lancet form in each of the eight bays. The structure culminated in a short arcade frieze, above which was a cornice and a helmet roof of eight facets covered in dark tile -- Aleviz's preferred roofing material. Modified in the late 17th and 18th centuries, the Cathedral of Metropolitan Peter has recently been restored to what is assumed to be its original appearance. The interior has been painted with new frescoes, and the cathedral was re-consecrated for worship in 1998. The Vysoko-Petrovsky monastery was again devastated in 1611 as a result of the Polish occupation of Moscow during the Time of Troubles, a dynastic crisis compounded by a civil war and social upheavals that devastated much of European Russia. The cathedral survived, and the monastery’s restoration, which began as early as 1612, included the construction of a brick wall. In the latter part of the 17th century, the dramatic rise in the monastery’s fortunes was closely connected to the Naryshkin family, beginning with Kirill Naryshkin, father-in-law of Tsar Alexei Mikhailovich, whose second marriage was to Natalya Naryshkina. With the birth of his grandson Peter in 1672, Kirill donated his Moscow estate to the tsar, who promptly transferred it to the adjoining Vysoko-Petrovsky Monastery, thus doubling its territory. After Alexei Mikhailovich’s death in 1676, Fyodor — his son by his first marriage, to Maria Miloslavsky — ruled briefly, but Fyodor’s death in 1682 created a complicated situation. Both of Alexei Mikhailovich’s remaining heirs — Ivan V, his sickly youngest son from his first marriage, and Peter I, his son from his second marriage — were still too young to rule, but each was supported as heir by the competing Miloslavsky and Naryshkin clans. Seeing the greater health of Peter, the boyar council and Patriarch Joachim, leader of the Russian Orthodox Church, proclaimed Peter the tsar. However, a revolt in April-May 1682 by disgruntled soldiers known as streltsy led to the granting of regency powers to Sophia, Alexei’s daughter from his first marriage. Sophia and her faction were able to persuade the Patriarch to proclaim Ivan and Peter co-tsars. During this violent episode, Kirill Naryshkin’s sons Ivan and Afanasy were killed in the Kremlin in the presence of young Peter, their nephew, as the Miloslavsky family gained temporary ascendancy over the Naryshkins. The murdered Naryshkin brothers were buried at Vysoko-Petorvsky Monastery, and Kirill was forced to become a monk at the northern Kirill-Belozersky Monastery. To commemorate her brothers, Natalya Naryshkina supported the construction of a new brick Cathedral of the Bogoliubsky Icon of the Virgin (1684-1690) on the site of previous wooden churches, the earliest of which was built by Dmitry Donskoy in 1382. Although the interior was thoroughly ransacked during the Soviet period, the exterior has been restored. Next to the southwest corner is a Naryshkin burial chapel. During her regency, Sophia also bestowed favors on the Vysoko-Petrovsky Monastery. Increasingly fearful of the power of her half-brother Peter and assured of the debility of her brother Ivan, Sophia attempted a coup in 1689, again with the support of the streltsy. In the wake of its failure and the triumph of young Peter I, Sophia was placed in confinement at Novodevichy Convent. The streltsy regiments were disbanded, and many of their number were tortured and executed by Peter, who remembered all too well the murder of his uncles. In 1696, work was also completed on the monastery bell tower, placed above the gate Church of the Intercession. The open arcading of the two-tiered octagonal tower over the gate church is a daring exercise in structural design with wide openings that disseminate the ringing. Like the other monastery structures of this period, the bell tower is brightly decorated and has long been a landmark in central Moscow. 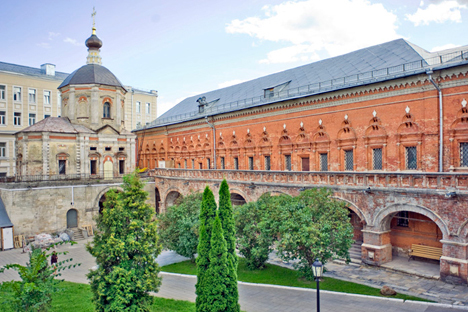 The monastery’s largest component completed in the 1690s is the brick cloister building known as the Naryshkin chambers because of its association with Natalya Naryshkina. Its long red façade with decorative windows forms a distinctive part of Petrovka Street. In the late 19th century, the cloisters were extended by the construction of a multi-storied building with a polychrome brick façade. The 18th century brought small additions to the monastic ensemble, such as the Church of the Tolg Icon of the Virgin (1744-50) and the Church of Saint Pachomius the Great (1750-55), erected over the monastery’s south gate. The Vysoko-Petrovsky Monastery met a grim fate during the Napoleonic occupation of Moscow in 1812. Although many valuables had been evacuated to Yaroslavl, the monastery churches were desecrated, and French authorities held tribunals that condemned many to death on suspicion of arson. Those executed were buried near the bell tower. After its revival, the monastery became a major center for religious education and publishing in Moscow. After the establishment of Soviet power, the monastery briefly functioned as a refuge for clerics driven from other institutions, but in 1926 it, too, was closed. Severe damage was inflicted on the buildings, and only in the 1950s was it recognized as a cultural monument that should be preserved. In 1992, services resumed in the Church of St. Sergius of Radonezh. Since that time, this monastery constructed in homage to Metropolitan Peter has undertaken an ongoing program of restoration that has created an oasis in the center of Moscow.